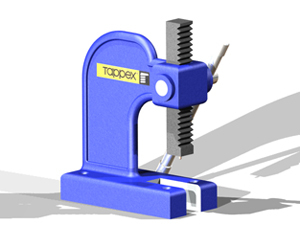 The Tappex Heat Inserter has been specifically designed to provide reliable and efficient heat insertion of Multiserts in many thermoplastic applications. 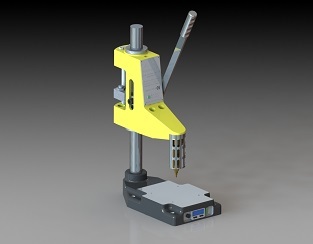 It is of rugged construction and features a variable feed-back temperature control to suit virtually all grades of thermoplastic and also a speed control to prevent the operator overriding the correct insertion cycle time. An indicator light illuminates as soon as the insert is fully installed. It has an output of 400w and comes complete with three interchangeable heat tips, for different sizes. Other heat tips are available to order to suit most applications. Multiserts can be successfully press fitted cold, into the softer and more elastic grades of thermoplastic material, and the Tappex Arbor press has been designed for such low volume cold press fit applications. It provides a reliable and accurate installation, provided a suitable jig is made to locate the moulding firmly in the correct orientation for the inserts. However for harder grades of thermoplastic, press fitting needs to be assisted by either heating the insert or by using ultrasonics to prevent the plastic becoming stressed which can lead to cracking over time, particularly in thin sections or in long thin bosses.